The awards range from $500-1000. A student who is awarded a student travel grant must attend the conference in person, as indicated above. The student must register, attend, and present the paper (if the student is a co-author) at the conference. Payment will only be made to the student as long as the award recipient submits the expense report (with receipts) within 45 days after the conference. More details will be provided to the students who are selected to receive the STG award. The application should be submitted electronically via EDAS. After logging into EDAS, click the “TravelGrant” tab at your EDAS home page, and then select “Student Travel Grant for IEEE ICC 2017". A support letter from the student's advisor. A motivation of the student to attend the conference and how the conference would change his/her research including outcomes and experience expected from the conference attendance. Availability of funds from other sources. Additional Information: Please address any question to the Student Travel Grant chair, Youssef Nasser at yn10@aub.edu.lb with mandatory title: “IEEE ICC 2017 STG Question: Your Last Name”. 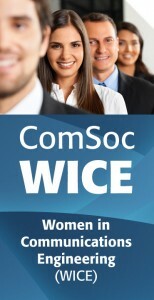 Acknowledgments: Women in Communications Engineering (WICE) is supporting IEEE ICC 2017 through two student travel grants.